Flight controls take care to manouvre an aircraft. Almost each civil and military airplane has normal (with exception of very complicated aircraft like the F-117 Nighthawk and the B-2 Spirit) flight controls. We will explain what flight controls are and how they are used on military airplanes. But for the normal visitor we will first explain what flight controls contain. Because this is a military website we will analyze the flight controls concerning military airplanes. Flight controls can be divided into Primary Flight Controls (PFC) (1) and Secondary Flight Controls (SFC) (2). Primary Flight are to manouvre an airplane for pitch, bank and roll. PFC's are the most important during a flight. They need to be executed multiple (redundancy). When all secondary flight controls should be lost, the PFC are enough for a safe landing. The ailerons are used to roll or bank a airplane. Each airplane has normally ailerons which are located on the trailling edge of each wing. They occur a momentum around the longitudinal axis of the airplane so the aircraft will roll. On large airplanes (Boeing 747, C-5 Galaxy) there are 4 ailerons; inboard ailerons (or high speed airlerons) and outboard ailerons (low speed airlerons). The inboard ailerons are used at high speeds. The outboard ailerons may then not be used because of the risk of aileron reversal. The outboard ailerons are used on low speeds. When the aileron on the left wing is up, the right aileron will be down and the aircraft will roll to the left. With the right aileron up and the left down the airplane will roll to right. The rudder is mostly mounted on the tail. All civil and mostly all military transport, tanker, AEW airplanes but also some fighter jets like he F-16 have one tail. A lot of military airplanes are different with 2 tails and so 2 rudders (like the: F/A-18 Hornet, SR-71 and the Su-30). Some large airplanes are having 2 rudders mounted on 1 tail for more safety if one should fail. The rudder can move left and right to create a momentum around the vertical axis of the airplane. The elevators are used to pitch an airplane. They are mostly mounted on the back of the horizontal stabilizer. When moving the elevators UP the airplane will move down, when moving the elevators DOWN the airplane will move up. 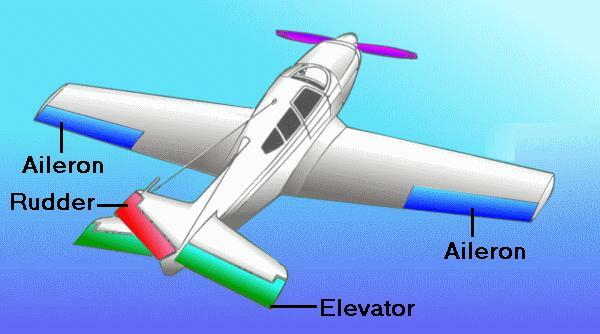 Flaps are used to create more lift. They can be mounted on the leading edge and at the trailling edge of a wing. Slats are often mounted on the leading edge of a wing. 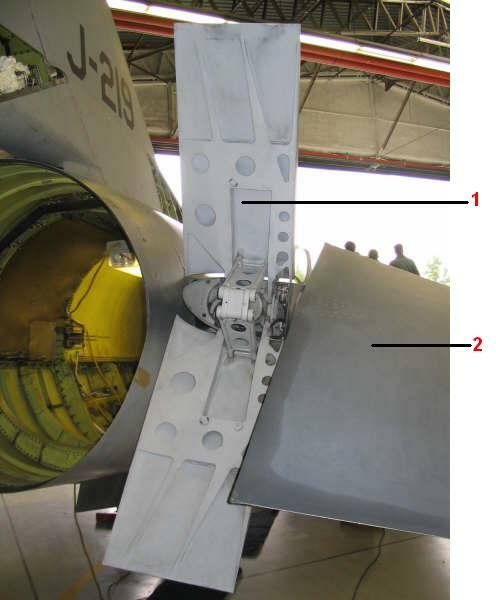 They are used when a wing gets stalled (with a too high angle of attack). Slats will move forward and creating a slot between the slat and the wing. The slats decrease the time of release of the wind flow thanks to their venturivorm. Spoiler are mounted on the top of a wing. In normal operation they are down but when up they will disturb the flow over the wing resulting in a increasing of drag and decreasing of lift. Spoilers can be used as speed brakes, or in case of failure of the ailerons they can be used to roll the airplane. On some airplanes there are 2 types of spoilers: ground spoiler and flight spoilers. On that airplanes the flight spoilers will only used as speed brakes in flight. The ground spoilers will only function as speed brakes when the main landing gear wheel touches the ground during landing or as speed brakes when the airplane has to abandon the take-off. Fighter jets normally are not having spoilers. They usually only have speed brakes (like the F-16). On some airplanes the horizontal stabilizer (stabilo) can be moved (rotated). For example on the Boeing 747, F-16 and F/A-18 Hornet.